If your order weighs less than 13 ounces, save huge on shipping with USPS first class (with tracking number). This product weighs 9.4 oz. 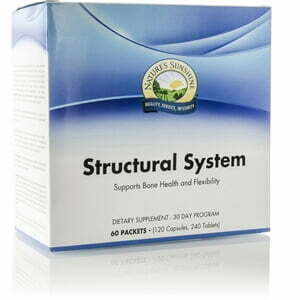 Nature’s Sunshine Structural System Pack is a 30 day program formulated to support bone health and help connective and joint tissue. Provides materials that the body uses to manufacture bones, muscles, ligaments, tendons, and skin. This balanced calcium–magnesium supplement is complete with vitamins, minerals and herbs, plus enzymes that help improve absorption. This herbal combination helps maintain joint tissues, supports the joints during physical stress, and supports muscle tissue. 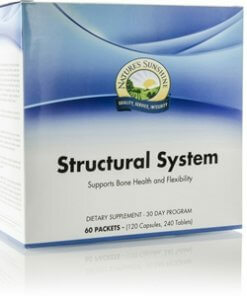 Offers the joint-supporting benefits of glucosamine, chondroitin, MSM, hyaluronic acid and devil’s claw in one tablet. This formula supports the integrity of the joint by providing nutrients that support normal viscosity and elasticity of fluid surrounding the joint, which helps maintain mobility. This formula also attracts fluid into cartilage, making it more shock absorbent.